We are extremely aware of the educational value of any teacher’s aid product and do all we can to research and find stimulating supplements on a daily basis. Santorella Publication’s is proud to say we’ve found another incredible item, Posters byPhil Black. The Phil Black Posters are a great example of what can happen when “graphic designer” meets “music educator”. Each colorfully graphic representation of key musical elements is sure to get your attention. The creative genius of Phil Black is certainly evident in each of these 11” x 17” posters. As every educator knows, keeping a high degree of enthusiasm is imperative for learning and captivating your student’s interest in a non-obtrusive manner is the key. Memory and understanding through repetition can be accomplished in many ways. One simple method is with a good educational tool that teaches your students in an effortless manner and Phil Black’s Posters exclusively distributed Santorella Publications is just one of those tools. Although the majority of posters are guitar related, also learning “The Circle Of Fifths” is extremely important and a necessity for every student of music. “Lead Guitar Scales” will teach you exactly what and where the notes are located on the neckof the guitar for playing an assortment of lead guitar scales. If you play lead, you must learn to play scales. Minor Pentatonic scales are by far the most common in rock, blues &country and learning these Pentatonic scales for playing lead guitar has never been easier. 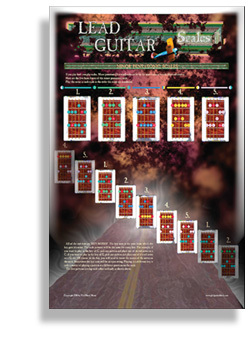 This graphically stimulating poster from Santorella Publications displays each of these scales in colorful diagrams. The use of brilliant colors helps to identify the keys and the melodic approach to playing each of them. Simply hang this poster in your music studio, practice room or perhaps on your bedroom wall. Any visible spot where “at-a-glance” help is all you need.